Oh summer is 2 weeks from being over. Yippie! The boys started a skate clinic today and they all had a great time! It starts at 8am so it is a great start to adjusting to getting up for school again! They also started replacing our roof today! They were here at 8:30am and just left a few minute ago...9pm! Loud is an understatment! It looks GREAT though! Makenzie amazingly fell asleep in the midst of it all. It took about an hour and she was really tired as I didnt even start trying to put her to bed until about 7:30pm. They should be back to wake me up with more banging around 7am and be done mid morning! Makenzie had PT and speech today! It was the first PT she has had in a week and she was not very happy to work at it again! In speech she played some computer games with Kaleb and she ROCKED! She is getting so good! Her therapist is adding more and more steps to her communication each time! She told me today that she loved me and asked for Kisses OVER and OVER!! All while looking at me with her princess eyes and huge smile!! We have decided on a talker and all have have to say is it will be PINK!! That is all that matters right? Just kidding! Now we have to start the process of getting a letter of Medical necessity and waiting on Medicaid! Her therapist thinks it will take about 6 weeks! Perfect timing for our return from NAPA! 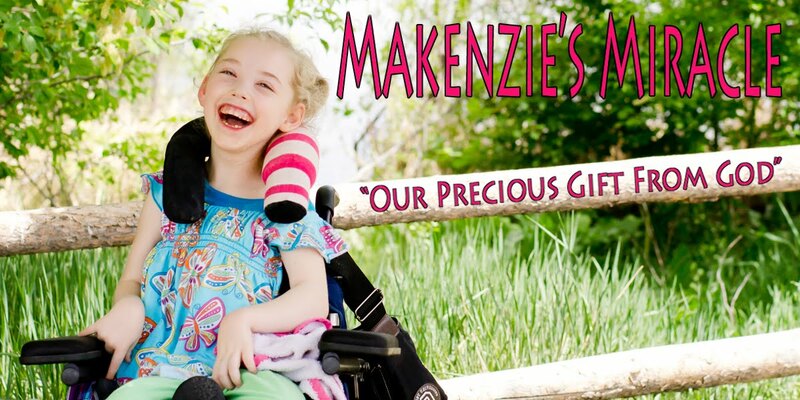 Makenzie has also be doing GREAT rolling from side to side and she has been getting onto her stomach a lot lately! We were playing a game today. I was on one side and Kaleb was on the other. She was rolling from side to side from Kaleb to me and back! It was so cute and look so much better then it did 2 months ago! I hope rolling all over the floor is coming next!!! Go God! Keep a working in my baby girl! Getting sick for Makenzie is not just getting sick. It affects her whole body for weeks! She is doing much better and her feeds are going ok. She is still on Zofran at night. She also has still been waking up once a night and throwing up. We are back to full strength formula however which is GREAT! She also has not had a bowel movement since Friday which is VERY unlike her. The doctor says that is pretty normal after a stomach bug so tomorrow if there is still none she will get some yummy poop medicine! TMI I know but it is my life and that is ...well... what I write about here! LOL!! I never imagined that poop would be the highlight or worry of my day! As far as the meeting with the school district. I read an e-mail sent to my Speech therapist today that suggests Aug 21st as the date. That is 3 days before school starts! We don't even know what school she is going to go to! No clue how they think anything will be ready for her to go to school! I still personally haven't heard one single word from them in 3 weeks about any of it! NICE! So they have until Friday and then I will have no choice but begin to retain an attorney. I have some names of some really good ones! I hope to not have to resort to that however this shouldn't be this hard! However this is the beginning of the next 14 years of her life and I refuse to be stepped on like this for 14years!!! Pray for continued health! Thanks for the support! !